On February 23, 2009 Eric Williamson was driving home from a birthday party. It was late at night, and there was a terrible snow storm. The darkness and icy streets were two ingredients that equaled disaster. Eric’s Jeep Cherokee slid off the road and flipped over. The Jeep landed in a ravine, a niche away from the road. He was thrown from his seat and lay in the frigid cold hoping someone would find him. Alone and badly injured, Eric’s survival mode kicked in motivating him to dig and claw through the icy sludge…to no avail. Eric, exhausted and slowly losing consciousness, felt himself letting go…going toward the pull of sleep. Fortunately, the driver of a state road snow plow glanced down the side of the road and spotted Eric’s jeep. Besides fostering his relationship with Shawn, Eric enjoys visits from friends and family. Like most individuals with spinal cord injuries it is comforting to have support during such dramatic changes. Eric looks forward to visits from his mother, and is deeply grateful for her unwavering support. Not only has the dynamics in Eric’s relationships changed, his view on life has broadened. Eric reported that he can now see that he was far too materialistic and cared about things that didn’t really matter before his accident. 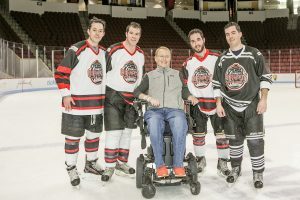 Eric is elated to have the technological resources such as the internet where he read about the Travis Roy Foundation’s mission and the incredulous work it does with individuals with spinal cord injuries. Eric Williamson’s story illustrates the importance of obtaining equipment that enhances independence for individuals with disabilities. 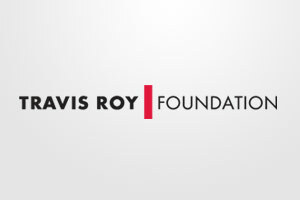 Thankfully, the Travis Roy Foundation is able to reach the world, and change it.